The market for independent films has nearly collapsed over the past two years. Big film fests like Sundance and Toronto haven’t yielded nearly the buzz or box office power as years past and big studios have shuttered many of their independent film arms. With the market changing so dramatically, many filmmakers are now pushing forward with their films instead of waiting and hoping for a studio to pick up their film for distribution. Jamin and Kiowa Winans of Double Edge Films aren’t letting the rough indie market slow them down. These two Denver based filmmakers have taken to the road with their film INK building momentum for the film city by city. 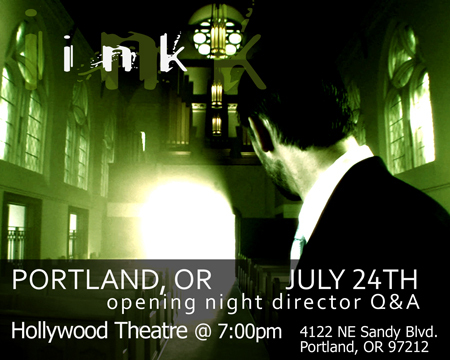 On Friday July 24th they bring INK to Portland for a one week run at the Hollywood Theater. INK is a multi-layered allegorical tale of good, evil and the search for redemption packaged in highly unique visuals and a haunting score. Ain’t it Cool News has declared INK the new “it” movie and compares it to Donnie Darko, The Matrix, Dark City and Brazil. While I haven’t seen the film yet (I plan on attending the premiere on Friday), I am quite impress with the look and style of the film in the preview and am eager to see the film. Huge fans of Portland, the Winans wanted to do something unique for their film here so they’re doing an after party ‘tweetup’ at the Whiffies fried pie cart at SE 12th and Hawthorne following the film on Friday. Whiffies is commemorating this with a special deal where you get 2 whiffies fried pies for $5 when you show your INK ticket Stub. Ink opens at the Hollywood Theater Friday July 24th at 7pm (with Q&A After) and then plays Saturday at 5:00pm & 9:10pm Sunday at 2:45pm & 7:00pm (with more showings through the following week). You can purchase tickets online for INK (which is recommended for opening night as the film has sold out in many cities including when it played New York). I am very anxious for this. Considering the chaff that has actually risen to the top in independent film over the last few years (Puffy Chair anyone?) I am hoping this gets the traction it deserves and ultimately this independent style of marketing will take off. That alone would really help filmmakers shake off the feeling they need Hollywood to do anything serious. I went to see it at the Hollywood last night. It would be rated R for language (and really nothing else). The costumes (post-effected) and set pieces were often astonishingly good. The story was certainly above average. The dialog was often a bit weak. The (surprisingly) few action sequences weren't of the caliber of the films to which it is generally compared. I'd say that it's most-similar to Daywatch (Nightwatch's sequel), but it successfully weaves its own pleasing tapestry from a whole lot of other sources with a conclusion that doesn't generally leave the audience feeling cheated (if they've been keeping up with what's been happening). I was particularly delighted by the pathfinder's Rube Goldberg sequence. Anyway, to sum up, yes a lot of the praise that people are dishing out on this film is overblown but it isn't entirely unwarranted. I recommend seeing this film if you get the chance (and like the films to which it has been compared). Great movie, I will see it again and again. So amazing, heartwarming, a "Now Movie". So much of the world wrapped into one movie, I was sucked into this movie in about five minutes and stuck in it until the opening credits. So incredible! The actor were very special I really like the the little girl and her protector, Liev. Such a strong chemistry between them, and so believable. I cried and and I want to tell the world about this movie, that moved me in so many ways. I give it 5 out of 5 stars and highly recommend it.